The other day, a friend of mine asked me if The Flash could travel through time. The answer to that question is "Yes he can". That got me thinking of when was the first time he actually did travel through time. That lead me to this comic here, The Flash #125. This comic holds the first appearance of the Cosmic Treadmill. It was built by Barry Allen (AKA The Flash) and is how The Scarlet Speedster is able to travel to the future and past. Now, I'm not 100% sure that this is the first time that The Flash actually travels through time or not, but since he can't travel through time without the treadmill, there is a good chance that it is. If anyone knows for sure, please chime in in the comments section. Taking a look at the CGC census, there aren't a lot of graded copies. To date, there have only been 67. Two of them are graded at a very high 9.6 NM+. I couldn't find any sales data for any 9.6 NM+, but I did find one for a very respectable 9.4 NM. In 2006, a 9.4 NM copy of The Flash #125 sold for $3250 at icollector.com. That's a lot of moolah. I'm sure it has a lot to do with there being so few high grade, near mint copies in the market. However, There are some 8.0 VF and 8.5 VF+ copies out there that you can get for a fraction of that price. As we look at the sales chart from gocollect.com, you can see that there have been very few sales on the eBay. 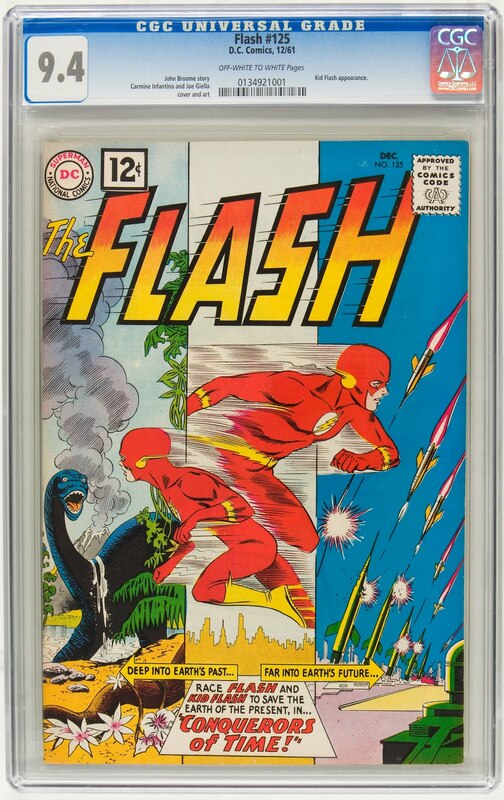 I looked at the active listings on eBay and found only one graded copy available right now and ComicLink.com only has three. There are a quite few raw copies though. This is a somewhat overlooked key issue at the moment, but as this comics key issue status becomes more well know there may be more graded copies that hit the market. It also may be a key issue that many people don't really care about and the amount of graded copies won't really change. Either way, If you're looking for an affordable earlier Silver Age key issue in a VF - VF+ condition, this one may be one to look into before it ends up on the radar of someone else. Thanks for your fun article! The original Flash did travel through time. For example, in Comic Cavalcade #19, Flash is zooming along after Tag Madden when: "Oh-oh! I've done it again! By running counterwise to the motion of the Earth, I've moved right into a different time period!" The first Barry Allen time travel is actually in his first comic, Showcase #4, where he takes a criminal back to the future, saying: "By traveling fast enough, close to the speed of light, I can set up vibrations that will project our bodies into the future."